Have you seen the horrific video of an Indian grandfather thrown to the ground during an encounter with police in Madison, Alabama? Despite the beautiful and growing movement of South Asians for Black Lives, there’s a conversation, and an organizing moment, that we’re missing here around criminalization and South Asian communities. Sureshbhai Patel’s assault in Madison, AL is a moment to have this conversation. 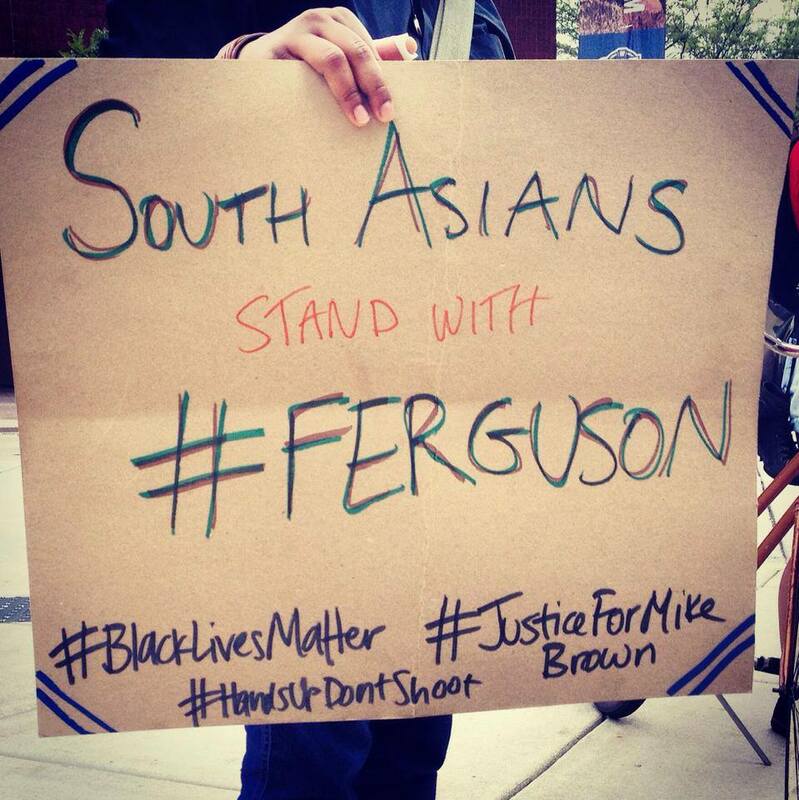 If we want to organize South Asians in this country, we need to talk about the stake that South Asians have in combating police brutality and violence. First, I want to make one point clear: I believe in standing in solidarity with Black Lives Matter movements, and in centering Black voices and leadership in the conversation around police brutality. Period. I’m also committed to the project of organizing South Asians in the U.S. And as organizers, we need to talk strategy. We need to meet our people where they’re at. We need to take moments like these to talk not just about anti-Black racism, but also about the real stake that we have as South Asians in combating racial profiling and police brutality. The conversations I’ve been following, largely spurred by Anirvan Chatterjee’s important article, focus on anti-Black racism as the root of Mr. Patel’s assault. That is certainly one of the roots of this violence: as Anirvan points out, the 911 caller is worried about a “skinny black guy” who makes him worried to leave his wife home alone. However, we’re missing an opportunity here if we don’t talk about racism and xenophobia towards South Asians as part of this story—and part of what allowed a police officer to slam an innocent man into the ground. While the cops were called on Sureshbhai Patel because he was perceived to be Black, he was thrown to the ground and nearly paralyzed because he was read as brown. Once the cops arrived on the scene, I assume they realized Mr. Patel was Indian—Mr. Patel could not speak English, and simply repeated ‘India’ in an attempt to communicate with the police. He marked himself as brown and as immigrant—and the intersection of these identities rendered him worthless enough to be left with two broken vertebrae, for doing nothing at all. The “War on Terror,” the war on immigrants, are fought on our literal bodies. Some of us, especially working class South Asian organizations such as DRUM or the NYTWA, have been making these connections for years. The rest of us need to get on board, especially wealthy South Asians who have never experienced class-based violence with the police. As South Asians in this country, many of us are afraid—that we might be one shade too dark, or one beard too threatening. Whether we’re becoming part of a growing ‘model minority mutiny,’ or whether we’ve always felt outside the model minority myth, the time to have these conversations is now. We need to validate the fears that our communities face, and use that as an entry point into conversations about race and policing in which we have a real lived stake. We also need to emphasize that Mr. Patel was Indian in American—not Indian-American. If Mr. Patel had been an American citizen, would the cop who assaulted him have been fired, and potentially charged with a crime? I don’t know. The chances are higher, certainly, than for the many young Black men who have been killed by the police finding any semblance of justice. There have been many African immigrants killed by the police, in cases that have drawn national attention. Those officers were not immediately fired. Most importantly, despite grievous injury, Sureshbhai Patel is still alive and recovering. I doubt that a Black man in America would be able to say the same. Mr. Patel had a foreign embassy—of a rising power, no less—to back him up. Ironically, his foreignness was both what spurred his assault and what catalyzed a response. Mr. Patel was assaulted because he was Indian, because he was South Asian. There’s an urgency to this framing. This is an entry point to have conversations at multiple levels. I understand the political project of locating the root of racism against South Asians in anti-Black racism; I’ve worked to do the same. Some of us are making the connections to anti-Black racism and to solidarity work. Some of us know that when Black people get free, we all get free. For others, we need a different entry point—one based in our lived experiences. Solidarity takes work. As South Asian organizers, we need to be prepared to hear, validate and mobilize the fear that this assault brings up. If we are committed to building a mass movement, we need to recognize that Mr. Patel was brutalized because he was brown, and name the reality of violence that so many of us already fear. We need to draw the connections between this case and the Chapel Hill shootings. We need to name the multitude of ways that brown bodies are vulnerable in this country. This is an organizing moment for South Asians in the U.S. We need to work to mobilize our people where they’re at, and recognize as valid the fear we so rarely discuss. Terrorism, xenophobia, and racism are drawn onto our bodies. These aren’t theories; they’re our lived realities. Now is the time, more than ever, to draw these connections and to organize with our people—both in solidarity with Black Lives Matter and against our own brutalization. As an organizer and educator working with students of color, when Dear White People came out I had to watch it. From the various trailers, and the tagline of “being a Black face in a white place,” I was excited to see a film center the often invisible experiences of Black college students at a predominantly white institution. Overall, I enjoyed watching the movie. The trials and tribulations of Black students, ranging from the trivial to the dangerously violent, rang painfully true. I could relate to the struggle of a handful of students of color to respond: the confused passion of Sam, Lionel’s perpetual search for community, the idealistic and pragmatic activist embodied in Reggie. Despite its redeeming qualities, I left the theater feeling deeply unsettled by the film’s portrayal of Asian Americans. [Spoiler alert.] Towards the end of the film, Lionel informs the Black Student Union that there is a party being organized on campus based on stereotypes of African-American/Black students. In short, white students are required to perpetuate blackface in all of its forms at this event. After Lionel alerts the BSU, Sungmi, the one Asian American character in the film who has a speaking role, encourages BSU members to join with the Asian American and Latin@ student organizations on campus to charge into the party and shut it down. In theory, this is great – students of color in the broadest sense should all have a vested interest in protesting campus parties based in dangerous stereotypes. However, in Dear White People‘s portrayal, Asian Americans and Latin@ students are literally rendered voiceless. (1) The viewers don’t see their decision to join BSU members in shutting the party down, and simply see angry Asian faces, and a single Latino face, confronting white partygoers. These angry Asian faces have no names, no history, no context—and literally no voice. Is there a more typical Asian American stereotype than an Asian without a voice? Despite Naomi Ko (the actress who plays Sungmi) and other voices celebrating the progressive portrayal of Asian Americans in solidarity with Black folks, I’m not convinced. There is a more nuanced racial politic at play here. Asian Americans often have the racial privilege of being seen as a ‘model minority,’ a stereotype that can be used as a shield against the anti-Blackness that undergirds the most brutal forms of American racism. Asian Americans need to do internal work to build a racial awareness that locates and places ourselves on the racial hierarchy of the U.S. If you aren’t able to speak to the long and arduous process of building solidarity across these racial differences – don’t show a half-baked version. The dark side to the Model Minority Myth is a portrayal of Asian Americans as timid and voiceless, hard-working minions without a mind of our own. If you can’t portray Asian Americans as multi-faceted, don’t portray us at all. Instead, show the equally powerful story of Black students standing up for themselves, and pushing back against a party with a centuries-long history of racism. If you want to prioritize a demonstration of cross-racial solidarity, including Asian Americans, take the time to build it, on or off screen. It’s not enough to demonstrate Asian Americans standing in solidarity with Black folks; you have to show the internal and cross-community work that leads to that coalition. Solidarity and coalitional politics aren’t achieved overnight (or simply through “having better snacks”). It’s a long, drawn-out, painful process, a constant assessing and re-assessing of our shared struggles, our radical possibilities, and our contradictions. Without that process shown, or even gestured towards, on screen, Asian Americans are reduced once again to racial props, ready to step in when necessary but without names or voices, issues or agendas. If we don’t grapple with the hard questions of how we truly shape our issues as interconnected, and how we arrive at the always tenuous conclusion of solidarity, we risk losing the potential to truly build—while simultaneously reifying age-old Asian American stereotypes. The Project on Fair Representation, a legal defense fund backed by self-professed “charity” organization Project Liberty, Inc. is running smear web campaigns against the University of Wisconsin-Madison, University of North Carolina-Chapel Hill, and Harvard University over charges of “racial discrimination.” On the campaigns’ web pages, Asian faces are prominently displayed next to the tagline: “Were you denied admission? It may be because you’re the wrong race.” These campaigns claim that Asian Americans are subjected to racial quotas in college admissions and are unfairly rejected from some of the nation’s top universities. They play off the popular and yet unfounded idea that affirmative action hurts not only white students, but also Asian Americans. The campaigns are funded primarily by one man: Edward Blum, founder and one-man staff of Project Liberty, Inc. who is determined to end so-called racial discrimination in university admissions. The Project on Fair Representation is not Blum’s first foray into the politics of affirmative action. Blum was also a driving force behind the most well-known challenge thus far to affirmative action in this generation: the notorious Fisher vs. University of Texas case, starring Abigail Fisher, a white woman, as the plaintiff. Though Blum claims that he is not using Asian Americans as a racial wedge, this new campaign relies on the racially charged idea that Asian Americans in the U.S. have attained a “culture of success” that has led to racial discrimination against them in university admissions. Recently, there has been a surge of media coverage focused on the “success” of Asian Americans spurred by author Amy Chua. By sensationalizing “tiger moms” and a cultural “triple package” of traits, Chua has revived the model minority myth. As Chua would have it, Asian Americans’ “success” is based upon the strong work ethic of Asian migrants, in contrast to Black and Latino “laziness,” allowing Asians to quickly accumulate wealth in this country. Unfortunately, this false idea of an inherently superior Asian work ethic has informed our national conversations around Asian Americans and affirmative action. The power of racism lies in its ability to shift form; similarly, the enduring power of the model minority myth depends upon its ability to perpetuate itself by ignoring the role of immigration policy in shaping Asian success stories. An Asian American “culture of success,” which fuels Blum’s anti-affirmative action arguments, ignores history and fails to account for the role that the U.S. immigration system has played in creating stratified classes of migrants. Most notably, following decades of Asian immigrant exclusion solidified by the Immigration Act of 1924, US Cold War fears spurred the passage of the 1965 Hart Celler Act. This Act instituted immigration preferences for “highly skilled” or technologically skilled migrants, along with options for family reunification. As a result, a great number of highly skilled, highly educated new Asian immigrants joined the US population, carefully screened for their skills and, often, for their economic status. This influx of Asian immigrants with political, social and educational capital fueled the model minority myth, and resulted in the higher economic status of certain Asian immigrant groups that persists through the present day. The idea of “success” as a cultural trait erases both the role of immigration legislation and the historical and social struggles of those who did not have the advantage of having economically privileged forebears. In order to perpetuate the false myth of an inherent Asian culture of success, it thus behooves Blum, Chua and their supporters to undermine Asian American battles for affirmative action, along with any Asian American working class struggles. It is hypocritical for those of us who have economically and socially benefited from migration to deny access to others by undermining affirmative action. Even in the U.S. political left, affirmative action is framed as a system designed to increase access and circumvent discrimination, while immigration is understood to exclude and discriminate in the name of “protecting borders.” Upon closer examination, however, these systems are strikingly—and disturbingly—similar. Both affirmative action and immigration are usually presented to communities of color as points of access: to institutions of higher education and to the “American Dream.” In reality, both these systems grant access only to a select few without challenging broader power systems or creating true structural change. Affirmative action is lauded as a system of access, but is only beneficial for those few allowed past the gates. Immigration provides access and the illusion of “success” for those handpicked by the U.S. government, while leaving the majority of those who wish to migrate, often due to U.S. influence in their countries of origin, without the means or permission. While affirmative action and immigration both allow conditional and limited access, neither of these systems provide any avenue for structural change — in higher education institutions or immigration policy. Affirmative action and immigration function as band-aid measures, providing temporary and incomplete “solutions” to the racism that pervades education and global inequity. True reform would necessitate a reworking of both higher education and immigration legislation from the ground up, opening classrooms and borders, and allowing for a free flow of knowledge, capital and people. Instead, institutions of higher education remain steeped in whiteness (despite a few brown faces) and immigration policy continues to ignore the power dynamics and policies that so often necessitate migration. As Asian Americans, we need to reframe our histories and stand in solidarity with all marginalized peoples looking to increase their access — whether through immigration or through affirmative action. It’s time for us to decide where we stand in this latest attack in the war against affirmative action. Asian America: can we please not be the face of the Project on Fair Representation’s new campaign? We need to raise awareness about how Asian Americans have struggled to institute affirmative action, not to abolish it. We need to acknowledge that we have been part of an immigration strategy designed to create a “culture of success,” providing conditional access on the back of mass exclusion. We need to stand in solidarity with all people looking to increase their access through the flawed systems available, whether affirmative action or immigration. And of course, we need to refuse to be a prop in white America’s plan, used and then discarded when we’ve outlived our racial value.